Cat Stevens and Hutch Bessy are two bounty hunters who are after the man who robbed a train of $100,000 in gold and slaughtered everyone aboard. All clues lead to one Bill San Antonio. This information proves perplexing considering that Cat apparently killed Bill in a gun duel a few months prior. After a few close calls, the two hired killers join forces and track down Bill and his gang. 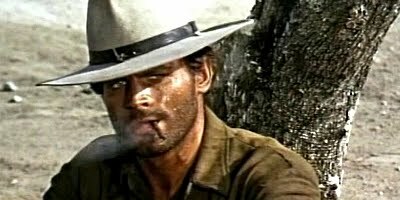 Giuseppe Colizzi's first western was also notable for showcasing the first pairing of Terence Hill and Bud Spencer, later to become wildly popular in the Trinity films and numerous comedy capers that came after. The seed for future comedy gold was planted here in this serious western that meticulously apes Leone's oft imitated style. This paid off handsomely for Colizzi as the film was the number 1 box office hit in 1967. Colizzi's movie offers polished direction, if a bit sluggish in places. The music by the underrated Carlo Rustichelli is an odd choice and sounds like a better fit for a Sword & Sandal adventure. The first in a trilogy, the film, outside of being quite good, bears historical cinematic significance in the annals of the Italian western genre.